Christianity is an Abrahamic religion. Members of the religion are called Christians (Greek Χριστιανός). It is a monotheistic religion, meaning it has only one God. It is the largest religion in the world and is based on the life and teachings of Jesus of Nazareth. Jesus was a carpenter and preacher in ancient Judea. 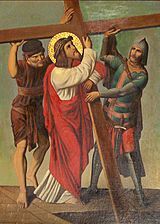 He was executed by being nailed to a cross (or crucified), under Pontius Pilate, the local Roman governor at the time. His life and followers are written about in the New Testament, part of the Bible. Christians see the Bible, both the Old Testament and New Testament as sacred. The Gospels or "The Good News" are the first four books of New Testament that are about Jesus' life, death and rising from the dead. Most Christians believe in the Trinity, which means that there are three different persons of the Godhead. The three persons of the Godhead are the Father, the Son, and the Holy Spirit. God created the world. Jesus is the name of God the Son. Christians believe Him to be the Son of God. They believe that He was the human son of the Virgin Mary and the divine Son of God. They believe He suffered and died to free humans from their sin, and was later raised from the dead. He then went up into heaven. Christians believe that Jesus will come back to Earth to judge all mankind, both alive and dead, giving everlasting life to those who believe in him. The Holy Spirit is the spirit of God on the Earth that spoke through prophets. Christians believe that the prophets foretold in Old Testament of Jesus as the Savior. Christians think of Jesus Christ as a teacher, a role model and someone who revealed who the Christian God was. Just like Judaism and Islam, Christianity is an Abrahamic religion. Christianity started out as a Jewish sect in the eastern Mediterranean. It quickly grew in number of believers and influence over a few decades, and by the 4th Century it had become the dominant religion in the Roman Empire. The Kingdom of Aksum became the first empire to adopt Christianity. During the Middle Ages, the rest of Europe mostly was Christianized. At that time, Christians were mostly a religious minority in the Middle East, North Africa, and parts of India. Following the Age of Discovery, through missionary work and colonization, Christianity spread to Africa, the Americas and the rest of the world. Christianity has been an important part of the shaping the world. As of the early 21st century, Christianity has approximately 2.2 billion followers, which is about a third of all people of Earth. The most basic part of Christianity is the belief in Jesus as the Son of God and Messiah (Christ). The title "Messiah" comes from the Hebrew word מָשִׁיחַ (māšiáħ) meaning anointed one. The Greek translation Χριστός (Christos) is the source of the English word "Christ".Joshua is English for the Hebrew word Yeshua. 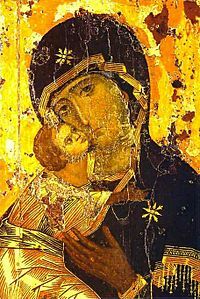 A depiction of Jesus and Mary, the Theotokos of Vladimir (12th century). Christians believe that, as the Messiah, Jesus was anointed by God as ruler and savior of all people. Christians also believe that Jesus' coming was the fulfillment of messianic prophecies of the Old Testament. The Christian belief of the Messiah is much different than the contemporary Jewish concept. The main Christian belief is that, through the death and resurrection of Jesus, sinful humans can be reconciled to God. Through this, they believe they are given salvation and the promise of eternal life. 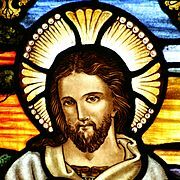 There have been many theological disagreements over the nature of Jesus over the first centuries of Christian history. But Christians generally believe that Jesus is God incarnate and "true God and true man." Jesus, having become fully human, suffered the pain and temptations of a mortal man, but he did not sin. As fully God, he defeated death and came back to life again. According to the Bible, "God raised him from the dead," he ascended to heaven, is "seated at the right hand of the Father" and will return again to fulfill the rest of Messianic prophecy such as the Resurrection of the Dead, the Last Judgment and the final creation of the Kingdom of God. The gospels of Matthew and Luke say that Jesus was conceived by the Holy Spirit and born from the Virgin Mary. Only a little of Jesus' childhood is written in the canonical gospels, but infancy gospels were popular in antiquity. However, the time of Jesus' adulthood the week before his death is written much about in the gospels. Some of the Biblical writings of Jesus' ministry are: his baptism, miracles, preaching, teaching, and deeds. Christians believe the resurrection of Jesus to be the main part of their faith (see 1 Corinthians 15) and the most important event in human history, because it would show that Jesus has power over death and has the authority to give people eternal life. Among Christian beliefs, the death and resurrection of Jesus are two main events of Christian doctrine and theology. From what the New Testament says, Jesus was crucified, died a physical death, was buried in a tomb, and rose from the dead three days later. 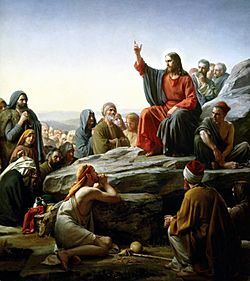 The New Testament writes that several times Jesus appeared many times before his Twelve Apostles and disciples, and one time before "more than five hundred brethren at once," before Jesus' Ascension to heaven. Jesus' death and resurrection are remember by Christians in their worship services, and most commonly during Holy Week, which has Good Friday and Easter Sunday in the week. Protestantism teaches that eternal salvation is a gift that is given to a person by God's grace. It is sometimes called "unmerited favor." This would mean that Salvation is God bringing humans into a right relationship with God through faith in Jesus Christ. It is the belief that one can be saved (rescued) from sin and forever death. Many Protestants believe in the "assurance of salvation"—that God can put confidence in a believer that he has truly received salvation from Jesus Christ. Catholicism teaches that although in most cases someone must be baptized a Catholic to be saved, it is sometimes possible for people to be saved who have not fully joined the Catholic Church. Catholics normally believe in the importance of works and sacraments in getting salvation. The Catholic Church teaches that faith is important, but it also believes that salvation also requires good works and piety, such as obedience to commands, taking the sacraments, going to church, doing penance and giving alms, saying prayers, and other things, to receive eternal life. Different denominations and traditions of Christianity believe in forms divine grace. Roman Catholicism and Eastern Orthodoxy teach the complete importance of the free will to work together with grace. Reformed theology teaches the importance of grace by teaching that a person is completely incapable of self-redemption, but the grace of God overcomes even the unwilling heart. Arminianism believes in a synergistic view, while Lutheran and most other Protestant denominations teach justification by grace through faith alone. Christianity uses the Bible, a collection of many canonical books in two parts, the Old Testament and the New Testament. It is believed by Christians that they were written by people who were inspired by the Holy Spirit, and therefore it is most often believed to be the word of God. There are some differences in Bible versions and editions throughout Christianity. Creeds (from Latin credo meaning "I believe") are direct doctrinal statements or confessions, usually of religious beliefs. They started as formulas used when someone was baptised. During the Christological controversies of the 4th and 5th centuries they became statements of faith. Many Christians accept the use of creeds, and often use at least one of the creeds given above. A smaller number of Protestants, notably Restorationists, a movement formed in the wake of the Second Great Awakening in the 19th century of the 19th century United States, oppose the use of creeds. Trinitarianism is the teaching that God is three different beings; the Father, the Son (Jesus Christ), and the Holy Spirit. In the words of the Athanasian Creed, "the Father is God, the Son is God, and the Holy Spirit is God, and yet there are not three Gods but one God." Trinitarianism is the group of Christians who believe in the doctrine of Trinity. Today, most Christian denominations and Churches believe this. Churches have different teachings about the Trinity. Some say the Spirit comes only from the Father. Others say the Spirit comes both from the Father and the Son. This is known as filioque. Nontrinitarianism (also called Oneness) is the beliefs systems that do not believe in the Trinity. Many different nontrinitarian views, such as adoptionism or modalism, existed in early Christianity, leading to the disputes about Christology. Most Christians believe that human beings will receive judgement from God and are given either eternal life or eternal damnation. 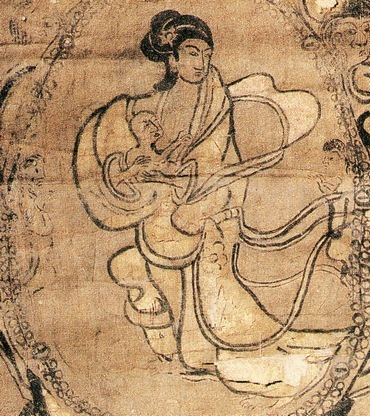 This includes the "Last Judgment" as well as the belief of a judgement particular to the soul after death. There are also some differences among Christians in this belief. For example, in Roman Catholicism, those who die in a state of grace, go into purgatory, where they are cleansed before they can go into heaven. Christians believe that at the second coming of Christ at the end of time, all who have died will be raised up from the dead for the Last Judgment, when Jesus will establish the Kingdom of God. There is also the belief of Universal Reconciliation. That is the belief that all people will someday be saved, and that hell is not forever. Christians who believe in this view are known as Universalists. to tell people that their mistakes and sins will be forgiven and will be saved if they believe and have faith in the Lord Jesus and confess that they have sinned (1 John 1:9) (John 3:16) (Ephesians 1:7) (Romans 10:9). to help people share in his life through the gift of God's Spirit. Worship is thought by most Christians to be a very important part of Christianity all through its history. Many Christian theologians have called humanity homo adorans, which means "worshipping ," and so the worship of God is at the very center of what it means to be human. This would mean that because God created all humanity, Christians should worship and give praise to God. Monument honoring the right to worship, Washington, D.C. Most Christian worship has Scripture reading, talk about Scripture from a leader, singing, prayer together, and a small time for Church work. Christians may meet in special buildings, also called Churches, or outdoors, or at schools, or anywhere Christians feel they are needed. The Catholic Church has developed a short ceremony, Eucharistic Benediction, worshipping Jesus present in the Eucharist. They also may visit a Church building to pray in the presence of the Eucharist, Eucharistic Adoration. The Orthodox and Catholic Churches spirituality place importance on the use of human senses such as sight and on the use of beautiful things. 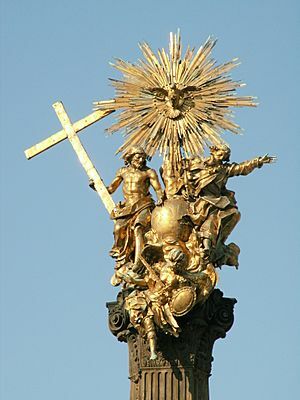 Catholic spirituality often involves the use of statues and other artistic representations, candles, incense, and other physical items as reminders or aids to prayer. The Orthodox Churches also use candles, incense, bells, and icons, but not statues. Orthodox and Catholic worship also makes use of movements, such as the Sign of the Cross, made by each person touching first the forehead, then chest, one shoulder, then the other shoulder. There is also bowing, kneeling, and prostration in Catholic and Orthodox worship. In Catholic belief and practice, a sacrament is a religious symbol or often a rite which shows divine grace, blessing, or sanctity for the Christian who receives it. 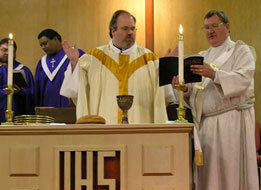 Examples of sacraments are Baptism and the Mass." The word is taken from the Latin word sacramentum, which was used to translate the Greek word for mystery. The two most regularly used sacraments are Baptism and Eucharist (communion). Most Catholics use seven Sacraments: Baptism, the ritual immersion of a candidate to welcome them into the church; Confirmation, the sealing of the Covenant; the Eucharist, a ritual where consecrated bread (discs of unleavened, toasted bread) and wine representing Jesus' body and blood are consumed; Holy Orders, Reconciliation of a Penitent (confession), Anointing of the Sick, and Marriage. Some Christian denominations prefer to call them ordinances. These are the Orders from Christ to all believers found in the New Testament. Roman Catholics, Anglicans, Eastern Christians, and traditional Protestant groups center their worship around a liturgical calendar. Some events that are part of this calendar are the "holy days", such as solemnities which honor an event in the life of Jesus or the saints, times of fasting such as Lent, and other events, such as memoria. Christian groups that do not follow a liturgical tradition often keep some celebrations, such as Christmas, Easter,and Pentecost. A few churches do not use a liturgical calendar. Alpha and Omega - The Greek letters Alpha and Omega are the first and last letters of the Greek alphabet. Alpha and Omega is a reference to God, who calls himself the "Alpha and Omega" (the first and the last letter of the Greek alphabet) in the Book of Revelation. Chi - The Greek letter Chi is the first letter of 'Christ' (Greek: Χριστός "Christos"). Chi Rho - The Greek letters Chi and Rho are the first two letters of 'Christ' in Greek: Christos. Usually the long stem of Rho (ρ) runs up and down through the cross of the Chi (χ). Christian cross - The cross is the most common symbol of Christianity. Christians believe that their saviour Jesus Christ was crucified by the Romans. The cross is important because Jesus died as a sacrifice for the sins of believers. It represents God's love for humanity. Crucifix - The crucifix is a cross with the body of Jesus still hanging on it. It is a more popular symbol with Catholics and Eastern Orthodox. It has the same meaning as the cross. Dove - The dove is a bird and a symbol of the Holy Spirit. When Jesus was baptised, the Holy Spirit came to him in the form of a dove and rested on him. The "ichthys", or "Jesus fish" was used by some early Christians, and is still used today. Ichthys - In Greek, the word ichthys /iktheews/ means 'fish', and forms an acronym, "Ίησοῦς Χριστός, Θεοῦ Υἱός, Σωτήρ", meaning "Jesus Christ, God's Son, Saviour" in Greek. Lamb - A lamb may be a symbol of Jesus himself, portrayed as the sacrifice for humans. Shepherd - A shepherd is also a symbol of Jesus himself and is used in the earliest Christian art. In the Bible, Jesus calls himself the good shepherd who cares for his sheep. INRI - INRI is an acronym in Latin "Iēsus Nazarēnus, Rēx Iūdaeōrum" meaning "Jesus the Nazarene, King of the Jews." This is the message that was put on the cross as being the crime for which he was being punished. Christians now use it as a symbol that Jesus is the Messiah, or King of all kings. Interlocking rings - Three interlocking rings are a symbol of the Trinity. Each ring is a complete circle, representing each complete person of the Trinity. But each ring is locked with the other two rings, showing that each divine person can not be separated from the Trinity. Christianity has had a large history from the time of Jesus and his apostles to the present time. Christianity began in the 1st century AD as a Jewish sect but quickly spread throughout the Greco-Roman world. Although it was originally persecuted under the Roman Empire, it later became the state religion. In the Middle Ages it spread into Northern Europe and Russia. During the Age of Exploration, Christianity expanded throughout the world, and is now the largest religion of the world. The religion had schisms and theological disputes that had as result three main branches: the Roman Catholic Church, the Eastern Orthodox churches, and the Protestant churches. People who call themselves Christians may show or live their faith in different ways. They may also believe different things. Through history the three main groups or "denominations" of Christianity have been the Orthodox, the Catholic and the Protestant churches. Not all Christians use these titles. Some believe Christianity is bigger and includes others. Some believe Christianity is smaller and does not include all these churches. Some of these groups could not agree on certain points about Christian teaching (called “doctrine”) or practice. The first split was in the 5th century after the Church Council of Ephesus. The council agreed Nestorianism was wrong. The Assyrian Church of the East did not agree and split from the rest. The argument was about the nature of Jesus. Should he be regarded as God and human in one combined nature, or in two separate natures? Most of the bishops, following the Pope (the Bishop of Rome), refused to stay in communion with any bishop who would not say "two separate natures". This was also discussed at the Council of Chalcedon, about 20 years later. The Christians who did not agree with the decision of the Council to excommunicate them, became the Non-Chalcedonian Orthodox. The largest Non-Chalcedonian Churches are the Coptic Orthodox in Egypt, the Ethiopian Orthodox, the Armenian, and some Lebanese Orthodox Churches. In general, these churches are known as Oriental Orthodox Churches. Recent discussions between the Roman Catholic Pope John Paul II and the Coptic Orthodox Pope Shenouda III concluded that they believe many of the same things after all, even though the Coptic Church does not recognise the Pope of Rome as its leader. The third split happened in the 11th century. It is called the Great Schism. It was mostly based on personal disagreements between the Bishops of Rome and Constantinople. The disagreements were made worse because the two cultures often did not understand one another. Also, many Crusaders from Western Europe behaved badly. The Christians in Western Europe were led by the Bishop of Rome, known also as the Pope. They are called the Catholic Church. Most Christians in Eastern Europe, Russia, and the Middle East belong to the Orthodox Churches, led by the Bishops of other cities or areas. In the 15th century the invention of the printing press made it easier for more people to read and study the Bible. This led many thinkers over the years to come up with new ideas and to break away from the Catholic Church. They started the Protestant or Reformed Churches. The most important Protestant leaders were Jan Hus, Martin Luther, and John Calvin. Later some of these groups disagreed amongst themselves so that these denominations split again into smaller groups. The main Protestant denominations today are the Baptist, Lutheran, and Calvinist Presbyterian Churches. In England, a similar protest against the Pope, first political and later religious, led to the Church of England which has bishops and officially calls itself Reformed Catholic but is often referred to as Protestant. The Anglican communion of churches includes several churches called "Episcopal" or "Episcopalian" because they have bishops. Some Anglican Churches have a style of worship that is closer to the Protestant services, others worship more like Catholics, but none of them accept the Pope, or are accepted by him. In general, the Protestant denominations differ from the Catholic and Orthodox Churches in having given up some of the traditional sacraments, having no ordained priesthood, and not having the same fondness for Mary, the mother of Jesus, that the Catholic and Orthodox churches have. Groups have different ideas on the nature of God. The pope is the leader of all Roman Catholics, but not all Catholics. Other churches have leaders similar to the pope. In the Eastern Orthodox Church, these are called Patriarchs. Some Christians say that women may not become priests. Some Christians say married people may not become priests. Some Christians say that priests can forgive sins by conveying the forgiveness of God, others say that only God can do this. In the last two centuries, the rise of atheism and scientific challenges to the traditional Christian story of creation have caused some to believe in Creationism, as described in the Bible, and others to argue that the Bible is not literally true, but more like poetry. With an estimated number of Christians being somewhere around to 2.2 billion, split into around 34,000 different denominations, Christianity is the world's largest religion. The Christian share of the world's population has been around 33% for the last hundred years. This has caused Christianity to spread throughout the world, mainly in Europe and North America. It is still the main religion of Europe, the Americas, the Philippines, and Southern Africa. However it is becoming smaller in some areas, some of them are; Oceania (Australia and New Zealand), Northern Europe (with Great Britain, Scandinavia and other places), France, Germany, the Canadian provinces of Ontario, British Columbia, and Quebec, the Western and Northern parts of the United States, and parts of Asia (especially the Middle East, South Korea, Taiwan and Macau). In most countries in the developed world, the number of people going to church who claim to be Christians has been dropping over the last few decades. Some believe that this is only because many no longer use regular membership in places, for example, churches, while others believe it is because people may be thinking that religion is no longer important. Most churches have for a long time showed that they want to be tolerant with other belief systems, and in the 20th century Christian ecumenism (the uniting of Christians from different backgrounds), advanced in two ways. One way was more cooperation between groups, such as the Edinburgh Missionary Conference of Protestants in 1910, the Justice, Peace and Creation Commission of the World Council of Churches started in 1948 by Protestant and Orthodox churches, and similar national councils, for example the National Council of Churches in Australia with Roman Catholics. The other way was creating unions for different churches to join together. Congregationalist, Methodist, and Presbyterian churches joined together in 1925 to form the United Church of Canada, and in 1977 to form the Uniting Church in Australia. The Church of South India was formed in 1947 by the union of Anglican, Methodist, Congregationalist, Presbyterian, and Reformed churches. And other such formations have been done by different Christian groups throughout the years. A depiction of the Nativity with a Christmas tree backdrop. An example of Byzantine pictorial art, the Deësis mosaic at the Hagia Sophia in Constantinople. Cathedral of Christ the Saviour in Moscow it is the tallest Eastern Orthodox Christian church in the world. 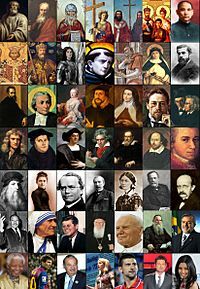 Set of pictures showcasing Christian culture and famous Christian leaders. A copy of the Summa Theologica, a famous Christian apologetic work. Ordination of a priest in the Eastern Orthodox tradition. Christianity Facts for Kids. Kiddle Encyclopedia.